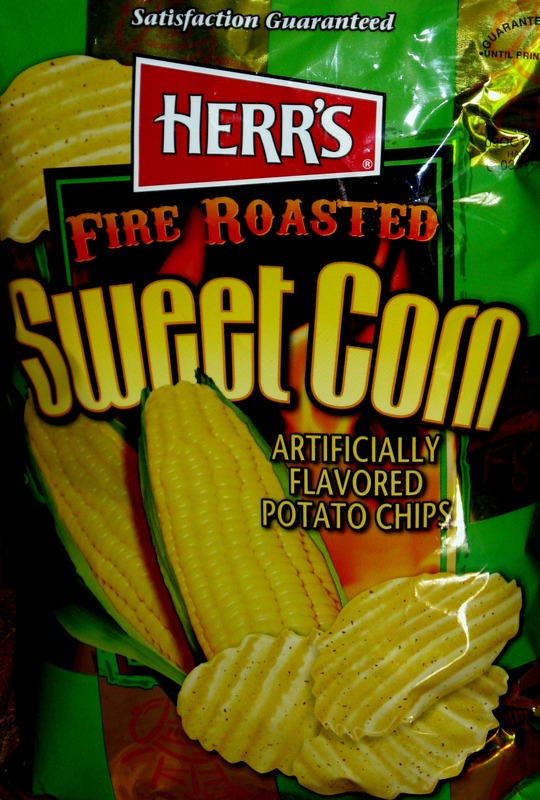 Nope, your eyes aren’t fooling you, these chips are in fact fire roasted sweet corn flavored potato chips. Unique flavor combination? Yes. First of its kind? We believe so. In the end, was this a good idea? Most certainly not! Chip Review had to dig deep into our archives to see if we’ve ever had another chip as unappetizing as these were to our palates. Turns out, we couldn’t find a single one that compared to these. In other words, that makes these, Chip Review’s numero uno, on our Top 5 Worst Chips Ever, and at the top of our ‘return to sender’ list! These chips can only be described as encompassing an extremely overwhelming artificial butter flavor combined with lots of creamed sweet corn. This synthetic flavoring alone was enough to turn us off, but combine this with the juxtaposition of a potato chip, and the combination is nearly abominable. Herr’s company has done us no favors here. We always appreciate when a company is willing to push the boundaries, but sometimes they just go too far, or it just doesn’t pan out. All that being said, Chip Review does believe each chip deserves a fair assessment, so we ask you to give these a shot for yourself, and let us know what you think. Agree or disagree, let us know. I totally agree — still have nightmares about these chips!!! Funny thing is, we’ve actually seen others comment that they love these chips…..to each their own! I agree with the nightmare comment, it’s been a few months and I can still taste these…. granted they do taste like corn, but in a mind-bending, unpleasant, get those away from me kind of way. I tried a few chips on a few different days… and then they went in the trash. Guess I am in the minority…. But I loved these chips. I found them at big lots last year and loved them. Never have seen since. Now to find that popcorn……. @ Jay Jordo – thanks for the comment. you would definitely be in the minority around these parts, but like we’ve told others, there are definitely die hard fans of these chips out there. what does seem apparent is that you either love them or you hate them!! I actually love these chips!! I can never find them where I live. I wish they had then here!!! Guess I’m with Jay Jardo and the minority is shifting towards a majority. Just tried them this week, April 17, 2019 and enjoyed the flavor! Maybe the flap has been reformulated since the original posting of the article? Ah, that should have been “flavor” and not “flap”.